There are numerous codes regulating residential swimming pool barriers. 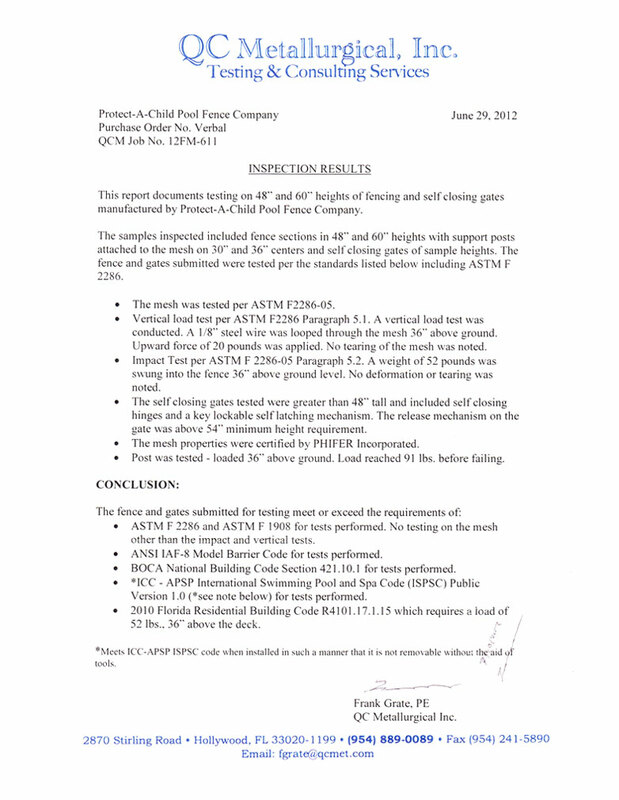 Protect-A-Child pool fencing has been independently tested and certified to meet or exceed these codes. The Florida Residential Building Code (FBC) was the first to establish a standard for removable mesh pool fencing in Florida, when mesh pool fencing was first approved as a required barrier around new residential swimming pools. Protect-A-Child’s extensive experience with the performance of mesh pool fences was called upon to draft much of this government standard. While it was a good start on a minimum-level standard, Protect-A-Child pool fences exceed these requirements. Count on us to build your fence according to our own more stringent standards based upon our 30 years of field-use experience. 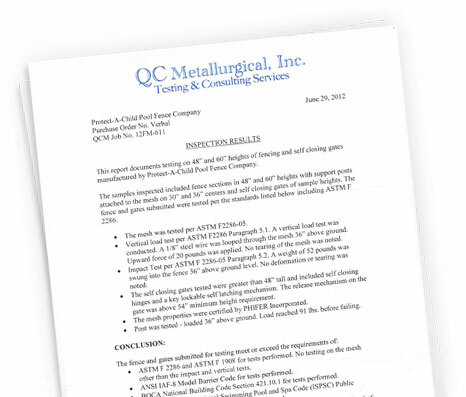 The American Society for Testing Materials (ASTM) publishes technical standards for a wide range of materials, products, etc. ASTM F2286-05 specifically addresses the design, performance, and assembly of removable mesh pool fencing. This standard borrowed heavily from language taken from the Florida Residential Swimming Pool Safety Act that produced the first standard for removable mesh pool fencing. Protect-A-Child pool fencing in 4 ft. (1.22m) and 5 ft. (1.57m) heights far exceeds the standards set by ASTM. The Building Officials and Code Administrators (BOCA) international code has been superseded by the new ICC (International Code Council) codes. BOCA codes leave a long legacy of codes still referred to in the East and Midwest US, such as 421.10.1, which refers to fencing around residential swimming pools. Protect-A-Child pool fencing in 4 ft. (1.22m) and 5 ft. (1.57m) heights exceed all BOCA and ICC codes. The American National Standards Institute (ANSI) IAF-8 Model Barrier Code specifies standards for pool fencing.Protect-A-Child pool fencing in 4 ft. (1.22m) and 5 ft. (1.57m) heights has been certified to meet this standard. The International Code Council (ICC) develops model codes and standards for the design of safe structures. Most US communities and global markets choose the international codes. Protect-A-Child pool fencing in the 4 ft. (1.22m) and 5 ft. (1.52m) heights has been certified to meet or exceed the ICC code for residential swimming pool fencing when installed according to the code requirements.